Add lots of style and light with one of these beautiful crystal table lamps. Major brands including Waterford, Dale Tiffany or ORE. I live in an 19th Century Maine farmhouse that my husband and I are slowly fixing up. We made the decision to maintain the original floorplan, which means we have lots of smallish rooms. This is great when it come to our heating bills and using fireplaces and wood stoves to keep rooms warm. But it also means that we have lots of dark corners to deal with. In the dark afternoons of winter, it can be a bit depressing to have lots of shadows in your rooms. I've found that crystal table lamps are wonderful ways to bring dark corners to life. The Draped Rose Crystal Lamp shown to the right is a perfect example of the kind of lighting that has been working well for us. It's traditional in design. The etched rose pattern in the crystal base is gorgeous. The satin finish accents add to the light reflection quality. The lamp can also hand a 150-watt light bulb so it produces lots of light! Put this 32-inch crystal table lamp from Waterford on a table and it'll reflect light beautifully into your room. The taller lamp height and the combination of two 60-watt bulbs will create a lovely glow. Depending upon the height of your end table or buffet, you might almost fee like you've added a floor lamp to your room. 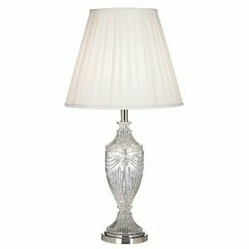 Another way to chase away dark room shadows is to combine a crystal lamp with sterling silver home accessories. The sterling silver creates even more beautiful light reflections. Create a beautiful vignette with sterling silver picture frames, candle holders, or trays. 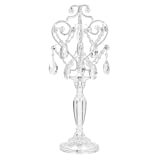 Crystal table lamps are also beautiful keepsake wedding gifts and housewarming gifts. You can opt for traditional crystal lamp designs or find a stunning modern crystal design. Whatever your interior design style - I'm sure that there's a writing table or work space that could use more light. Fashion-forward lighting style and home accessory describes this Giulio Table Lamp. It has strong modern curves from the three oval crystal orbs. The round chrome base adds to the modern style and artistic sense of the lighting. The simple round shade completes the ambience. The Giulio modern crystal lamp will look fabulous in any room of the house. Use it for reading, creating mood lighting for your party or for task lighting in your craft room. This is the kind of home lighting accent that you include in your home, when you want to feel like you live in a gallery. It is an exciting home accessory that shows the world you're not afraid to express yourself! The one thing I really love about decorating with crystal home accessories, is that crystal never clashes with crystal. You can mix and match colors and styles and never worry. In fact I love using many different brands and styles. It makes my home look like I've been collecting crystal lamps for a lot longer than 5 years! Crystal acts much like a prism, casting light about the space; it's light x2. Love the way light plays with crystal. It's a great look especially this time of year. Beautiful crystal table lamps! Your home sounds lovely! You don't have to have a sweet tooth to love these cupcake inspired home accessories - clocks, salt and pepper shakers, placemats, coasters, and more!